Painting dated dark cabinets saves this cozy kitchen. Careful prep means lasting results. Have your Golden Oak cabinets got you down? So over the Dark 70’s? 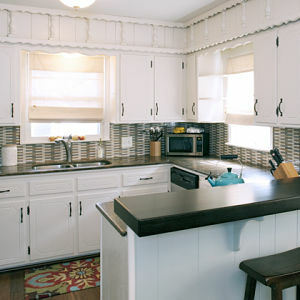 Change them – without the cost or hassle of installing new cabinets. Painting only – we don’t offer antiquing, glazing, etc. Crestwood Painting did a wonderful job on my kitchen cabinets. They gave an accurate and fair estimate, worked full days, and were extremely neat and courteous. They also worked during regular business hours so we could be out of the house. Generally, Kansas City kitchens are in the $3000 (smallish, no island) to $6000 (with island, med. size kitchen). Or more.